(LYTTON) The Songs of the Land project breathes new life into ancient Aboriginal music after a century of silence. And on July 29, the Nlakap’amux people will open up a treasure trove of songs and stories recorded a century ago on wax cylinders at a Community Consultation Workshop, Performance and Feast in Lytton. “This is a huge step for our process but it is only the beginning,” said Kevin Loring, Artistic Director of the Savage Society. The four-day workshop and symposium (July 29-August 1) will see Loring and a company of Aboriginal artists consult with the community on the music’s artistic and spiritual importance. They’ll explore how the material can be adapted for use in a modern performance piece. Loring – a Governor-General Award-winning playwright – and his company will be joined by Wendy Wickwire of the University of Victoria, the foremost authority on the life of anthropologist James Teit, who recorded the Nlaka’pamux songs and stories a century ago. Loring will be joined by University of Victoria Professor Wendy Wickwire, who will give a lecture on Teit and his relationship with First Nations. Originally from the Shetland Islands, Teit moved to B.C. in 1884. He married Susanna Lucy Artko, a Nlaka’pamux woman, and became immersed in First Nations culture. At the time he made them, Teit’s wax cylinder recordings were state-of-the art. He captured sacred songs like “The Shaman’s Song,” songs that Nlaka’pamux women sang while working and other traditional music. After Teit’s death in 1922, the recordings were stored at the Canadian Museum of Anthropology in Ottawa. Now, the recordings have been lovingly digitally re-mastered and will sound fresh and alive at the Songs of the Land workshop and symposium. Loring and his fellow artists will give a presentation and performance based on their work at a community feast on August 1. 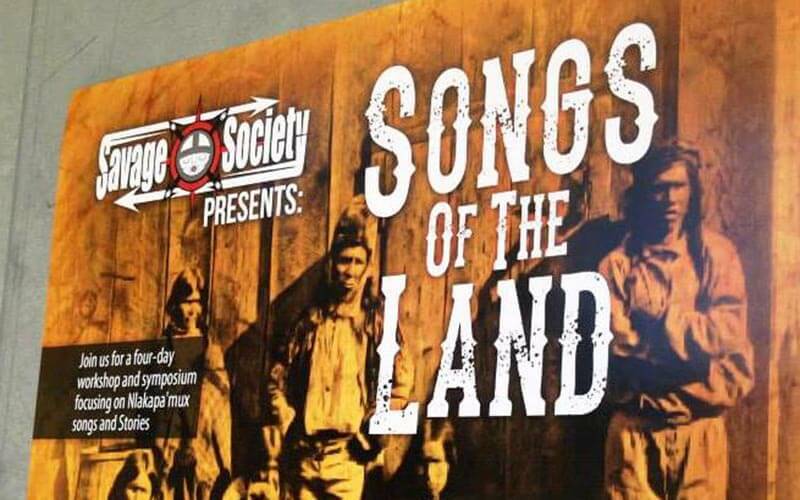 The Songs of the Land Project is a joint-initiative of the Savage Society and the New Pathways to Gold Society (NPTGS), a community-based non-profit society dedicated to First Nations reconciliation and economic development via heritage tourism. Terry Raymond, NPTGS Co-chair, said the Songs of the Land project demonstrates the Society’s commitment to First Nations reconciliation. Loring adds that Teit, Artko and the Nlaka’pamux recorded these songs and stories at a time when the culture was being outlawed and stripped away. “My hope is that this project will be the beginning of a process of reconciliation and reclamation of our songs and stories, to find new songs to sing and new stories to tell that source our lands and waters, our mountains and valleys and the spirit of the people who have always lived there,” he said.